Lou would also like to get to know you guys a bit more. 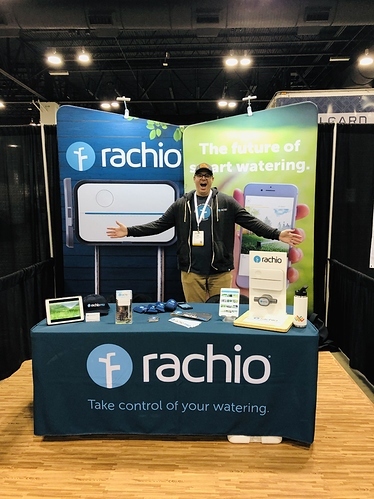 He wants to know: what’s the most creative way you’ve used your Rachio to water? (Special plants, hacks, etc.) Get to know Lou here and answer his question in the thread below! Beer. Like most Coloradans, I believe it doesn’t get much better than enjoying a full day outside and celebrating with a couple cold ones! Some of my favorites would be Odell IPA and Epic Brewing’s Big Bad Baptist Stout. Ski powder in Japan. I’ve wanted to go to Niseko in Hokkaido, Japan for quite some time. Hoping to make that a reality in the near future! What about your new position at Rachio are you most excited about? Our team. Everyone I have met at Rachio is passionate about what they do and driven to help this company succeed. Our products are awesome and it is easy to tell that this team wants everyone to know it. Dumplings… they are delicious little pillows of joy stuffed with flavor and surprises. Anthony Bourdain was the reason I got into cooking and discovered my passion for it. I would love to just hear what he has to say about ANY topic. Von Miller is an absolute unit, a good man, and my favorite Broncos player. JK Rowling was someone who was never discouraged no matter how many times she was told no when trying to publish Harry Potter. It would be a dream to hear her insights on the Harry Potter series and her overall success. Hey Lou! Thanks for everything you guys do!